What to take to hospital? What to take to hospital for you and your baby? Baby Care Experts have compiled a quick, simple and comprehensive list of essentials to take with you to hospital. 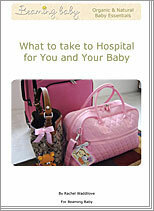 Its a good idea to have your hospital bag ready about a month before your baby's due date. With this list checked off and your bag packed, you'll be able to relax, and focus on other things! A simple, practical list of things to take to hospital for you and your baby.